“Irish” Joey McCreedy from Lowell, Massachusetts improved his record to 15-6-2, 6KOs with an a six round unanimous decision victory over Steven Tyner who dropped to 3-13-2, 2KOs. 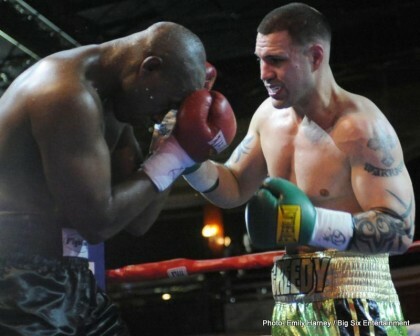 McCreedy received all three scorecards, 60-54, 60-54 and 59-55 in this light heavyweight matchup. He controlled the fight by outworking and out landing Tyner. He pressed the action and had Tyner backing up for most of the fight. Tyner had an effective jab but he couldn’t get any other sustainable offense going. McCreedy has won two in a row. “Royale Rumble” at the Royale Nightclub in Boston, Massachusetts was presented by Big Six Entertainment. Iraq War Veteran, Chris Traietti scored a third round technical knockout win over Randy “The Rattler” Campbell when Campbell`s corner ended the fight before the start of the fourth round, as Campbell appeared to have a broken nose and was taking a great deal of punishment. Traietti destroyed Campbell in this cruiserweight bout as he landed whatever he wanted, including numerous powerful punches that had Campbell stumbling backwards as he tried to cover up. Traietti from Quincy, Massachusetts, knockdown Campbell in the second round, curtsey of a right hook. Traietti upped his record to 15-3, 11KOs and has won five consecutive fights, all this year, since losing to world title challenger, Edwin Rodriquez. Campbell from Bowerston, Ohio, fell to 3-11, 2KOs. Alexis Santos from Lawrence, Massachusetts remained undefeated, 12-0, 10KOs, as he garnered an six round unanimous victory over Kevin Franklin from Charleston, West Virginia who fell to 4-8, 1KO. Santos won all three scorecards, two scorecards, 60-53 and one scorecard, 59-55. He dominated this heavyweight fight as he dictated the fight, landed several big shots and almost knocked him out in the third round, but Franklin held on. Antonio Chavez Fernandez won an extremely disputed six round split decision over Greg Vendetti with two judges giving scores to Fernandez, 59-55 and 58-56 while Vendetti got the other scorecard, 59-55. Fernandez from Brockton, Massachusetts upped his record to 4-13-2 while Stoneham, Massachusetts` Vendetti dropped to 4-1-1, 3KOs. This is the second consecutive bout that Vendetti performed much better than Fernandez, yet somehow the judges didn`t see it that way. Vendetti controlled the fight, landed more punches, especially power shots and pressed the action for all six rounds of this welterweight matchup, while Fernandez didn`t land anything of significance for the entire bout nor did he throw that many punches. Last time they fought, Vendetti scored two knockouts and controlled the fight, but it was ruled a majority draw. Two former female world title challengers, Aleksandra Magdziak Lopes and “Notorious” Nicole Woods battled to a six round majority draw in their welterweight matchup. Scores were 58-56 for Woods and two scorecards of 57-57. Lopes from Marshfield, Massachusetts by way of Poland is 10-2-1, 1KO while Woods from Stone Mountain, Georgia is 11-12-3, 3KOs. This was a extremely difficult fight to score as both women had their moments but neither one was able to take control of the bout, so the majority draw decision was appropriate. “Speedy” Rashidi Ellis, the 2012 National PAL Champion from Lynn, Massachusetts recorded four knockdowns against Oscar Diaz in the first round of their junior welterweight bout before the referee stopped fight with 2:16 left in the round. Ellis, with the technical knockout victory, improved his record to 3-0, 2KOs while Oscar Diaz from Hartford, Connecticut fell to 0-3.